This post has more pictures of basketweave/baltic pick-up inkle weaving I have done, along with their patterns and notes of things I learned while making them. If you want to learn more about how to do this kind of weaving, look at my how-to post! That post also explains better how to read the patterns. This weaving is based on the Midrealm award of the Dragon's Heart, which is given to those who have performed services on behalf of the Middle Kingdom above and beyond service normally expected of subjects of the Crown. I did a pattern of inverted hearts. Putting all the hearts facing the same direction would create floats that were too large between the hearts. I couldn't find a pattern I was happy with at the time when doodling the hearts in other directions and adding decorative details between the hearts. You can see the floats on the backside of the weave on the rolled-up portion. Also, I like how the checkerboard pattern mimics the green dragon scales of the award. Dark green is bared threads. Pale green is dropped threads. Continue inverting the hearts over and over again. I wish DeForest were here. He had a Dragon's Heart... I would probably gift it to him, if he thought he could use it. Miss you, love. The Award of the Purple Fret is a Midrealm award given for long and devoted service to a group, office, or kingdom. It is the first kingdom award given for service - the Dragon's Heart is a higher level award. I treated the purple lines of the award as all in one plane - in order to show the overlapping of the lines, the design would have had to be much bigger. I also needed to put a small decorative element in between the frets so that the floats would not be too big on the backside of the weave. As you can see, it worked quite well! The thread looks a bluish in the photo - it is indeed a deep purple. Two repetitions of the pattern. Note: it's not shown here, as I didn't take a picture of the ends of the weaves, but I usually start and end my weaves with a section that is plain weave (no dropped or picked-up threads). This is to make sure I can get the tension correct. If you don't want this, I would still recommend starting with a section that is plain weave - you can always take it out of the weave when you're finished. If you decide to leave it in, make sure you add a similar plain weave section to the other end of your weave if you want it to have that kind of symmetry. This is a Celtic pattern I jotted down from looking at a random inkle woven belt on deviant art. I would ask that if you weave this, please don't do it for profit. I have no idea if it's an original pattern of the artist or if this is a common celtic pattern (anyone know?). If it is their original work, I wouldn't want others to profit off of it. I wish I had a link to the inspiration for this to post, but I've lost it. Both sides of the pattern. You can see the pattern starting to repeat at the bottom - the entire weave is ~3 repetitions. One complete repetition. Start immediately at the top again after you finish the last row. Or be more creative and find a way to flip the design so the second repetition is flipped! 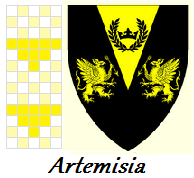 The Kingdom of Artemisia is one of the 19 Kingdoms of the Knowne World in the SCA. It is located in Utah, Montana, southern Idaho, and western Colorado and Wyoming. I am currently challenging myself to try and make inkle weaving patterns based on all the 19 Kingdoms (which I heard might be becoming 20 Kingdoms soon). This is the first weave I've done with the pattern threads roughly twice the thickness of the background and weft. I like the result! The far right is the front of the pattern, with the backside laying next to it going the same direction. This was a fairly simple weave to do. I originally thought to lengthen the yellow triangles - have them be 1, 3, 5, 3, 1 in length, not 1, 2, 3, 2, 1. But then I was doing a lot more manipulating of the threads (picking up and dropping them) because they didn't line up with the checkerboard as well, and the results didn't look much better than the 1, 2, 3, 2, 1 triangles. I believe this is because the yellow thread is bigger than the black, and it puffs up nicely. So I changed it and went with the simpler 1, 2, 3, 2, 1 triangles. Important: in order to get the flat top of the triangles, I had to pull up the 2nd and 4th threads. After finishing each triangle, I would nudge the corner of my shuttle underneath the 2nd and 4th threads and pull them up along the flat top side of the triangle. Looking at the pattern, you can see that I had to pick them up on that line (they would normally be on the other side of the weave). If I didn't tug them all the way up after finishing each triangle, the top has a slight dip at the 2nd and 4th strands, because they naturally wanted to lie on the other side of the weave and lost some of their length coming through to this side. A little tug, though, and the triangles had a flat top edge!